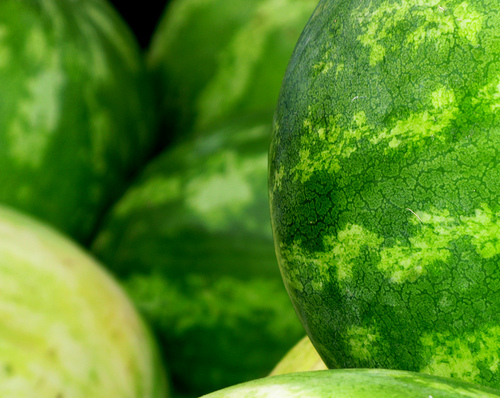 FEATURED PHOTO: SEEING GREEN & SNOOP (THE) DOG - What About Watermelon? I like the photo above because it reminds me of the watermelons at my local farmers’ market. And I like the photo below because it’s just funny. It’s a picture of Snoop, the photographer’s Rottweiler letting everyone know whose watermelon that is. The photo is entitled “Happiness,” implying that Snoop is smiling, but I’m not so sure if that’s a toothy grin or a don’t-even-think-about-it snarl. Either way, that watermelon is all his. A big thanks to Rob Greenleaf for letting me use this photo! I wouldn’t mess with Snoop’s watermelon either. Look at the size of those teeth, he’ll have no trouble eating that watermelon. You heard it from Snoop himself, Ellen. He’s smiling. I still wouldn’t try taking that watermelon from him.